Many articles related to office ergonomics often carry the same alarming warning – sitting is the new smoking. There are many ways to combat the toll on your body spending your days seated takes, by taking breaks and carrying out various exercises (as outlined in our previous blog post), however the most obvious solution is also the most 'against the norm' – a standing desk. Although there may be one or two people in your office that have a standing or sit/stand desk, they are yet to become as ubiquitous as the desk and chair setup- but their presence is growing, and for good reason. 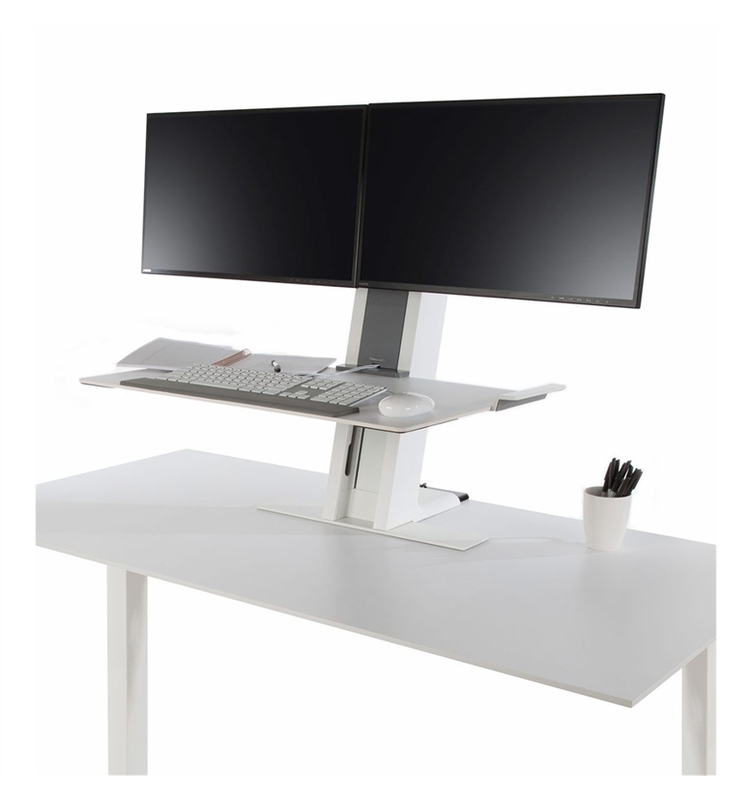 The first thing that tends to come to mind when people think of standing desks is a cumbersome treadmill desk – whilst these have their place, a standing desk doesn’t have to be quite as complicated as that. Your standing desk should be high enough so that your monitor is at eye level, and your keyboard in a position that allows your arms to form a right angle, leaving your forearms parallel with the desk surface. Those are really the two fundamental aspects of a standing desk, you can then experiment with wearing shoes or going without and whether to stand on a solid or cushioned surface, just be sure to adjust the desk height accordingly! Don’t go rushing straight into using a standing desk, ease into it if possible. Going from spending all day sitting down to all day standing up is going to be a shock to your system, so maybe a sitting/standing solution could be preferable, at least to begin with. As with most things, standing all day could also end up becoming harmful to you so be sure to move around often and give your legs a break at lunchtime. Many people find that they have more energy and are less easily distracted, and therefore more productive, whilst using a standing desk. However some can find standing all day a strain on their body and not worth the pain to reap the benefits. Whatever your preference- sitting, standing or both, we have a solution for you.